Every year I go to the Pasadena Showcase House of Design to tour a multimillion dollar mansion, gawk at the over-the-top rooms that each designer showcased, hang out with my mom and eat a light dinner at the on-site catering provided by a local restaurant. Ok…I must digress for a moment…the best, best room ever was a bathroom with a motion sensor toilet, flusher and lid. Everything about this toilet was Jetson’s style. It was CRAZY and hysterical, and of course, there was a phone in there as well. I mean who doesn’t want to chat away and use the toilet at the SAME TIME?! Now onto the food…I know toilet talk is not a great lead-in to food but it is what it is. Well, last year, I ate something totally memorable at the Showcase House…it was a Wolfgang Puck Cold Smoked salmon pizza. I can’t remember for the life of me what the Showcase house itself looked like, what style it was in or anything else about that evening, but I DO remember sitting on the lovely patio, breeze blowing, and taking bite after bite of that tender pizza crust with luxurious layers of pink smoked salmon on top of a tangy, dill infused cream cheese. Oh yes, I have brought you that recipe here and now and it is everything it is cracked up to be—you might even say it is SMOKIN’! Sorry…I love my puns…it’s in the genes. I just can’t hold back. It’s like having a fully loaded water gun and then putting it away without pulling the trigger. This weekend, it was 98 degrees in sunny California, and I had an unused ball of pizza dough just sitting in my fridge, waiting to be asked to the dance and I had the perfect partner to set it up with…smoked salmon. I rolled out the dough, popped it in the oven and whipped up some lemony dill cream cheese. I slathered on the cream cheese, layered the beautiful smoked salmon across the topped and sprinkled dill and capers over the whole thing. Ideally, some thinly sliced red onions would have been added as well, but I did not have any so they weren’t. To complete my plate, I threw together a strawberry-blueberry spinach salad and served it with some refreshing and sweet pineapple spears. While the scorching air was making everything melt outside our personal haven, everything inside was so cold, sweet and delicious. My husband said that he felt like he was on vacation and eating at some nice little cafe. How sweet! If it’s he! !ish hot where you are, maybe you could throw together this smoked salmon pizza. Use a precooked crust if you want to let the oven remain off, your kitchen stay cool and let the salmon be the only thing that is smokin’ ! 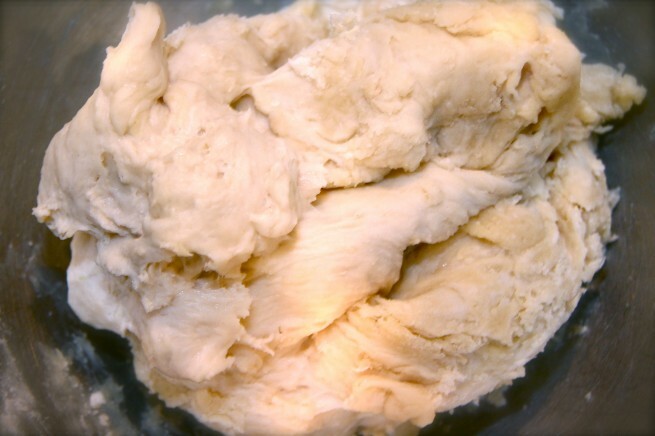 For the crust: In a small bowl, dissolve the yeast and honey in 1/4-cup warm water. 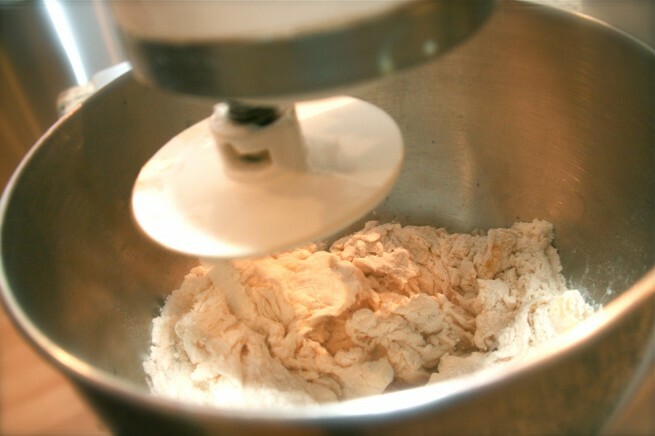 In a mixer fitted with a dough hook, combine the flour and the salt. Add the oil, yeast mixture, and the remaining 3/4 cup of water and mix on low speed until the dough comes cleanly away from the sides of the bowl and clusters around the dough hook, about 5 minutes. (The pizza dough can also be made in a food processor fitted with the steel blade. Pulse once or twice, add the remaining ingredients, and process until the dough begins to form a ball). Preheat your oven to 425 degrees. Roll out your dough onto a well-floured pastry board to the size of your pizza pan and place the dough onto a spray coated pizza pan. Cook your pizza crust alone for about 20 minutes. It should be firm and a little golden. Cool the crust completely (I put mine in the fridge for about 20 minutes so it got nice and cold). In the meantime, put your cream cheese, lemon juice and dill into a food processor and process for about 20-30 seconds until creamy and well combined. When the crust is cold, spread your cream cheese mixture over the entire pizza. 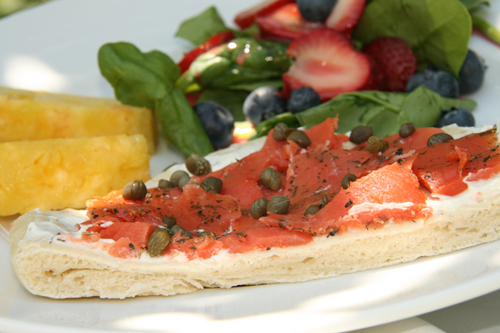 Layer slices of the smoked salmon over the top and sprinkle with the capers, sliced onions and remaining dill. Slice and serve. This is very nice for an appetizer if you make little pizzas! 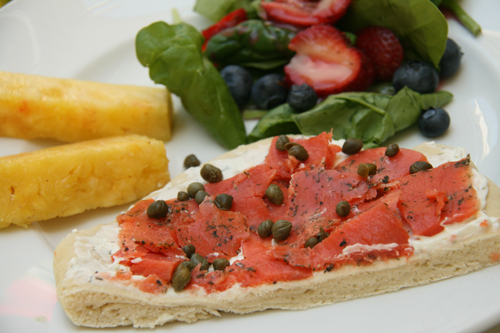 This looks delicious, I would never have thought to make smoked salmon in pizza and the strawberry-blueberry spinach salad compliments the dish well. Hi Nye! It’s supposed to be 109 today…I wish I had it sitting in my fridge. It’s a very refreshing meal. Thanks for stopping by. I just adore a no cook recipe… especially in the summer! This looks perfect. And it would be so simple (yet elegant) to throw together to take to a party. In other news, I made another batch of your black and white cookies last night. I think I have a problem! Hi Leah, your tomato pie looks absolutely decadent! Thanks for the nice comment…it is VERY SIMPLE…especially if you buy any kind of premade pizza crust or pizza dough. wow.. I love smoked salmon…. yum. Me too! Your butter cake was absolutely AMAZING last night. It will show up on this blog soon! What a great idea. I love smoked salmon and cream cheese so for a pizza topping, this would be wonderful. The onion makes a difference also. It gives some crunch. Personally, I would like tomatoes, on it. Ooo, this pizza looks delicious! Although I’m biased since I love pretty much anything involving salmon, cream cheese and dill! Thanks for sharing! What a terrific idea! I love smoked salmon, and I have leftover dough (which I froze for a rainy – or hot! – day) from our pizza making last weekend. I’m very excited to try this! Yum! !